On Saturday, the 1st day of competition at the British Rowing Senior Championships 2016, the Men’s U23 Coxless Four title was won by UL, after fierce racing with crews from both Oxford and Cambridge. 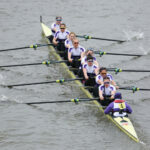 The UL Women then impressively matched the Men to take the Women’s U23 Coxless Fours title, as well as an overall Silver Medal. Both the Men’s and Women’s crews also set U23 British records. Saturday’s small boat racing also saw Emily CRAIG and Robyn HART-WINKS (racing as lightweights) set a British Record in the Semi-Final before coming away with an overall Silver Medal in Women’s Doubles. Irish U23 UL athlete Patrick BOOMER teamed up Josh TOLLEY to take overall 5th in the Men’s Double and there was a debut in Purple for freshers Sheyi BLACKETT and Hattie ORR, both of whom have raced for Great Britain as juniors. 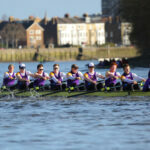 Sunday saw the Eights racing commence with 6 UL eights taking to the water. The UL Men’s 1st Eight raced well to make the A Final, setting a British University record in the Semi-Final. The Men’s Eights A Final only featured crews from UL, Oxford Brookes and Leander Club, UL coming away with a final ranking of 6th out of 36. 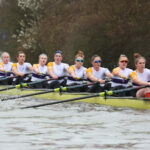 The UL Women’s 1st Eight knocked Newcastle out in the Semi-Final and lead Oxford Brookes, to make the A Final. They then put in an impressive performance in the Final. Rowing away from Oxford Brookes and Oxford University, closing on Cambridge Univeristy (the only student crew to beat UL) in the final stages, to take an overall Bronze Medal. Leander Club’s GB squad athletes took the overall win. Today we raced with these pins in memory of Ailish Sheehan. A great bronze medal that she would have been proud of. Always missed, never forgotten.